The Applying Scientific Knowledge (ASK) Program is an experiential learning program in the College of Science and Mathematics that provides a pathway into research opportunities for early undergraduate students on the Wright State University campus. ASK Program participants will directly participate in the cutting-edge research with COSM faculty at Wright State University, and experience how their coursework translates into the world of scientific research by immersion into research experiences. Participants get to explore a specific area of science of interest guided by our COSM research faculty in ways not possible in the classroom setting. Participant projects contribute to larger, ongoing faculty research projects within the College of Science and Mathematics, and their work can be published in academic journals, as well as presented at local or national conferences. Unlike many other undergraduate research opportunities on campus, students may start the ASK program as soon as they are accepted into their COSM major. Students will be team-taught during their first term in the program, allowing them to have direct contact with a variety of faculty from multiple departments of the College of Science and Mathematics. Once they start their research projects, they may be mentored by a team of COSM faculty members rather than a single faculty as well. Students will earn a minimum of 9 credit hours of course credit through the ASK program which may count toward their degree program. Summer fellowship opportunities are available to ASK Program students to continue their research over summer term, providing support for the student as well as additional research supplies. The ASK Program will provide vital experience in undergraduate research, opening doors into other opportunities both on and off campus. The ASK Program is open to all students within the College of Science and Mathematics. Students must either be accepted, or qualify to be accepted into their major within COSM by the beginning of fall term when they start the program. The ASK Program provides a unique experience to students in that it allows students to have direct contact with research faculty within the College of Science and Mathematics early in their academic career that is otherwise impossible during their regular coursework. This program provides students to gain not just basic content knowledge of a topic, but in-depth, cutting-edge knowledge and experience on a specific topic of interest to them through significant interaction with research faculty within the College of Science and Mathematics. At the conclusion of their ASK Program experience, students will be guided into other research opportunities both on and off campus. This may include independent research opportunities within departments of the College of Science and Mathematics, departmental honors programs, or internship opportunities off campus with local businesses or the Air Force Research Laboratories. The ASK Program is pleased to provide competitive National Science Foundation-funded scholarship and fellowship support for qualifying students. ASK Program participants are eligible to apply for scholarships which would award the recipient up to $5000 each year for 3 years if the meet the qualifications listed below, including demonstration of finiancial need. Three scholarship recipients will also be selected for paid summer fellowship opportunities to continue their ASK Program research projects over summer term, as well as additional funding toward the needs of their project. Completion of one of the following combinations of courses: SM1010 and one Learning Community, SM1010 plus one gateway course to the major, one Learning community and one gateway course, two gateway courses to the major (gateway courses are majors level 1000 and 2000 level biology, chemistry, psychology, physics, mathematics, earth and environmental sciences, biochemistry or neuroscience courses required for the major, excluding nonmajor level courses). Once accepted to the ASK Program, participants will be directed to the scholarship application. Applicants will apply for summer fellowship opportunities during their first fall term of the program. ASK Program participants are eligible to apply for paid summer fellowship opportunities to continue their research project. ASK Program summer fellowship recipients will receive 12 weeks of pay to continue their research projects from May through the end of July. Their project will also be awarded additional funds toward needs. ASK Program participants will be directed to the fellowship application during their first fall term of the program. Applications are still being accepted for the 2018-2019 cycle of the ASK Program! Students entering the ASK Program must be in the process of completing a College of Science and Mathematics major. Students must have a 3.000 GPA or a 3.000 GPA in the two semesters prior to being accepted into the ASK Program. Should students not currently have a 3.000 GPA, students may still conditionally enter the ASK Program. Students who are not on academic probation, but do not currently have a 3.000 GPA, may apply for the ASK Program and may be accepted conditionally. These students, once accepted during spring term, must earn a 3.000 GPA in the spring term preceding beginning the ASK Program. These students must also earn a 3.000 GPA during their first fall term of the ASK Program. Failure to do so may result in removal from the ASK Program. 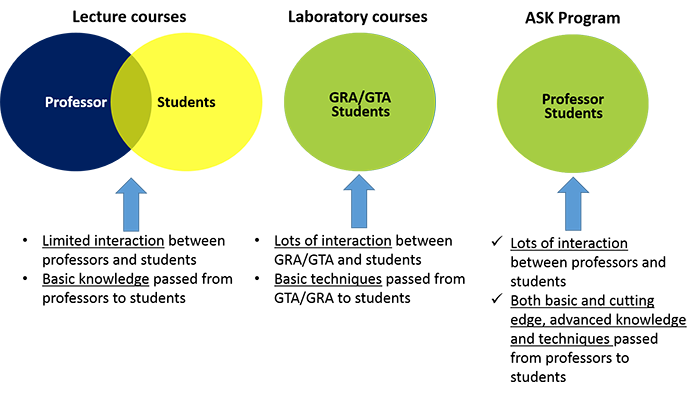 Students on academic probation are not eligible for the ASK Program, however are encouraged to apply once their GPA reaches 3.000 for two terms, consecutively. Should any student’s GPA fall below 3.000 while completing the ASK Program, that student may be put on probation, during which time they are given the opportunity to raise their GPA to 3.000. Failure to do so may result in removal from the ASK Program. Students may be admitted to the ASK Program directly from high school, and begin the program the fall term of their first year on campus. These students must be working toward completion of a College of Science and Mathematics major. To be eligible for the ASK Program, students must have a 3.000 GPA on their high school transcript. These students must also maintain a 3.000 GPA while completing the ASK Program. Should any student’s GPA fall below a 3.000 GPA while completing the ASK Program, that student may be put on probation, during which time they are given the opportunity to raise their GPA to 3.000. Failure to do so may result in removal from the ASK Program. Applications will be reviewed on an ongoing basis by the ASK Selection Committee and applicants will be notified with the decision via email. *This material is based upon work supported by the National Science Foundation under Grant No. 1742339. As Wright State College of Science and Mathematics alumni with a B.S. in Biological Sciences and a M.S. in Microbiology and Immunology, I was fortunate to have the opportunity to participate in undergraduate research on campus during the completion of the Bachelor’s degree. My experience in undergraduate research was the turning point in focusing my career goals. My choice of career was directly influenced by the experience I was able to gain through participation in experiential learning opportunities at Wright State University. I now have the opportunity to guide our current Wright State University COSM students into experiential learning opportunities through the ASK Program. Undergraduate research provides students invaluable insight into science and scientific fields, something that cannot be experienced in the classroom setting. It is my pleasure to serve as Director of the ASK Program in the College of Science and Mathematics. Have questions about the ASK Program? Email the director.